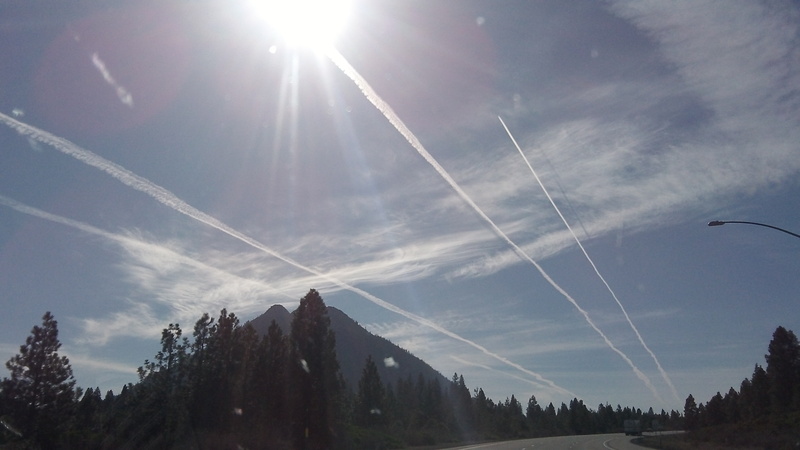 Vapor trails in the previously clear sky above Black Butte in northern California on March 8. It’s tempting to conclude that all that cloud-making high above us has to affect our weather in some way, such as by diminishing sunlight down here where we live. What’s puzzling is why, in a society as litigious as ours, no one has sued anyone because of it. Perhaps that because it’s hard to determine whom to blame, and even harder to pinpoint any damaging result. We live in a busy air traffic corridor, the West Coast strip just inside the coastal mountain ranges. What happens is that we start with a nice clear sky in the morning. Before long, though, dozens of commercial flights have traveled north or south, leaving a pattern of vapor trails up there, somewhere above 26,000 feet where the air temperature hovers around minus 40 degree. And not too much later, on days when atmosopheric conditions are right, some of those trails have spread into a thin layer of cirrus clouds that turns bright sunshine into a kind of haze. Contrails form when moisture condenses on soot particles in the exhaust of airplane engines. And the Pacific Northwest is particularly susceptible to the formation of these vapor trails because of its moisture-laden air. Scientists are pretty sure that a profusion of contrails affects the temperature at the surface, where we live, as I read in a story on contrails in rhe Christian Science Monitor. The story appeared about five years ago but is still available online. The question was whether contrails raised or lowered the temperature on the surface below. A cloud layer would reflect some sunlight and keep it from reaching the ground, presumably lowering thermometer readings ever so slightly. At night, though, the cloud layer would keep some heat from escaping upward, with the result that surface temperatures would not sink as much as with a clear sky. My husband & I LOVE to see the jets going north and south or east and west. We sit at the breakfast table most mornings and enjoy the sunrises. Surely there are worse things that need to be worried about! Hasso, here Pilots, Doctors & Scientists Tell Truth about Chemtrails [Excerpts]. Well Mr. Hering you had me concerned for a few seconds. I thought that perhaps you had ventured down the rabbit hole and were buying into the conspiracy theory of our evil government using hundreds of aircraft and thousands of personnel in a nefarious scheme to spray chemical or biological agents to control our weather or our minds. Sadly the same people that buy into the fairy tale of thousands of workers involved in such a project forget the old pirate’s rule for keeping secrets. “Three men can keep a secret if two of them are dead”. But when it comes to wondering why the lawyers haven’t gotten involved? Give them time. As soon as they smell money, they’ll show up. Back in the 50’s when these were very common, I wonder if the “Military-Industrial Complex” was behind it. Then again, it might have been the Air Force Base which was about 50 miles away. I was fishing on the Umpqua River March 5th and 6th. I saw two figure 8 vapor trails in the sky at about 25 thousand feet. At first we speculated that a jet had made an emergency turn around to head back to the airport but after we had a clear view of the sky, we could see not one but two figure 8s. I have never seen anything like that except maybe an air show.